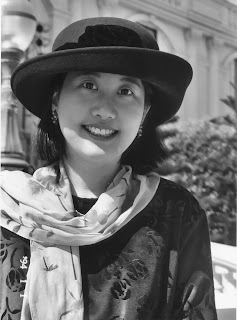 Karen An-hwei Lee is the author of Ardor (Tupelo Press, 2008), In Medias Res (Sarabande Books, 2004), and a chapbook, God’s One Hundred Promises (Swan Scythe Press, 2002). Lee has worked as a florist’s assistant, mended books in a rare-book archive, grown tissue cultures in a medical lab, and taught music lessons in the field of music therapy for mental health patients. Recipient of a National Endowment for the Arts Grant and the Norma Farber First Book Award from the Poetry Society of America, she chairs the English Department at a faith-based college in southern California, where she is also a novice harpist. Ardor is a book-length poem that’s shaped by a series of fragments, many announced on the left-hand column as letters, dreams and prayers. Slowly, perhaps even seductively, these fragments coalesce to tell a narrative about love, passion, and heartache as experienced perhaps by the blind protagonist in the poem, though this narrative is more abstract than concrete. It’s the recurring image of the pomegranate that suggests (despite the many Biblical references) that the story is Greek tragedy—Persephone ascending from and descending into darkness and sleep, so that there’s always a second-guessing about what’s real and what’s imagined. What are your expectations in offering readers such a challenging book, both because it is a book-length poem and because it’s difficult to encapsulate and summarize? Although linguistically intricate, Ardor‘s internal fugues—prayers, meditations, dreams, letters, jottings—hover transparently, I hope, between the earthly and ecstatic. The language blends an awareness of intimate minutiae with universal desires, such as yearning to love and be loved, to give meaningful names and to inherit one, to seek God and be known, intimately, by God. I answer this question with one raised by a poet. Anne Carson muses, “What makes a poet, accident or attention?” Both experimentation and linguistic attention can make poetry challenging. While I’m not exhorting all readers to join a revolution in poetic language, it’s been noted that language-driven aesthetics are seldom considered accessible by general readerships. Indeed, poetic compression, complexity, and poetry’s elliptical qualities—accidents or surprises while paying exquisite attention to language itself—may render poetry and experimental prose difficult, but to paraphrase Toni Morrison, that is what reading is. I suppose my response is partly about attention to language itself as experience. For instance, in researching how stained glass is made, I discovered the words “leadlight” and “ferramenta.” Attention shifted to surprise. The least intentional aspects of writing are often the most crucial to breaking open the geometry of craft. A unifying pulse is revealed, a flagon pours new oil or wine, or a source illuminates the internal architecture of a poem-organism. It’s a cell under a light microscope. Transparent envelope with a permeable boundary. Parcel of life. Ecstatic. Protean. Alive. How does a new poem live? Where? In one writing exercise, I ask students to imagine a cell as a transparent room. What furnishes this room? Look inside. What do you see? A mitotic glass pool? A tarnished mirror, a fish vat, a box of clay shards, childhood, a burned orchard, a lake bottom, nebulae, an airplane lying in a debris field? I encourage students to use surprises to shift attention without losing focus. A cardioid graph appears on the cover of Ardor, another enclosed shape, nearly cellular. Music, medicine, and mathematics are entwined. Cardioids appear in botanical nature, are the sensitivity pattern of certain microphones, and share an etymological root with cardiology. Advancing the quiet etudes introduced by In Medias Res (my first collection of poems), Ardor begins with an image that traces the path of a locus on a circle rotating around another circle of the same radius, forming an epicycloid with a cusp: A heart-shaped cardioid lingers on the margins where acoustical language evaporates or is saturated with fragrance. I look outside poetry to seek forms which may loan shapes to my writings. To this end, Ardor is a book of sequential cardioids: heart to heart dialogues, mothers and daughters, a blind woman who figures prominently in my writings—readers have inquired, who is this mystery person? A response appears in my next collection, Erythropoiesis—women waiting for their bodies to heal, a hidden water sonnet, a poem that cycles, and an epithalamium or two. she wears a corsage to cover the remains. the flow of blood widens through the heart. Poetry is also a natural vehicle for synaesthesia, present in Ardor through all the senses. Vowels are warm colors and consonants are cool colors, yielding rich tones, shades, intensities in form of musical perfume. When I was fourteen years old, puzzling aloud the effects of music to my piano teacher, whose name is Fern—I was remarking how a certain Romantic-period waltz sounded green yet was alternately saturated with mellow amber tones, the cork-textured key of E flat—she commented that not everyone experiences language and music in this way. (Arthur Rimbaud’s synaesthetic poem “Voyelles” was unknown to me then: “A noir, E blanc, I rouge, U vert, O bleu…”) Thereafter, Fern would inquire at the start of a new piece: What color is it? What fragrance? What textures? I rode my bicycle to flute lessons, a silver open-holed flute with a B foot jouncing in a side basket hooked to the seat. My flute teacher taught me the importance of breathing—the caesura—at the ends of phrases and the skill of varied articulation. I had an off-center embouchure, creating a warm dark tone in the lower registers but split notes in the higher ones, so she taught me to whistle enharmonics. I learned to achieve a focused tone in different registers, to maintain pitch, and to use proper breath support not to break a legato. Poetry, like music, has pitch, rhythm, dynamics, and registers. So, I express a hope that readers will find pleasure in light, color, fragrance, and meaning as poetic language engages experience in unconventional ways. Likewise, I pray this blessing for all readers of poetry, near and far. Letters, dreams and prayers, which are communication through intimacy, create a tone that’s distinctly vulnerable and, dare I gender the language, feminine. But this assessment is disrupted by the presence of mathematical quandaries and vocabulary that’s straight out of Gray’s Anatomy. This creates a tension that mirrors the push-and-pull between the many binaries that appear in the book: man and woman, pleasure and pain, order and chaos. The space of the page becomes conflict-ridden and complex, but it never compromises the beauty of the imagery and the fluidity of the music, even with words like “beta-fructofuranosidase.” Who are some of the poets (and perhaps, texts) that you turn to for inspiration and education? What are some of the languages (in the all-inclusive sense of the word) that guide you toward poetry? Voices returning to me over the years, variously, include Marguerite Duras, Saint Augustine, Clarice Lispector, Octavio Paz, Chuang Hua (Stella Yang Copley), Myung Mi Kim, Arthur Sze, Mei-mei Berssenbrugge; the prophets, gospels, and epistles in the Old & New Testaments; writings of mystic women and early itinerant female preachers, especially ones with fire-in-the-bones. I’ve written about Virginia Woolf, Theresa Cha, and Kazuo Ishiguro, so these authors are always with me in one way or another. Recently I enjoyed Kiran Desai’s Inheritance of Loss, Eileen Tabios’ I Take Thee, English, as My Beloved (wherein is the lovely phrase, “poetry as a way of life,” and a marriage to poetry complete with a wedding cake and satin bridal train adorned with poems), and Mother Teresa of Calcutta’s posthumous Come Be My Light. Languages I love are the four-tone syllables of Mandarin my parents taught me, translation proficiency in French I acquired in school, conversational Spanish in southern California where I now live, medical language pertaining to life and healing I studied, the language of theology and Biblical studies on the college campus where I teach—eschatological murmurings of parousia, dunamis, pneuma; talk of synoptic gospels L and M versus Q. I take pleasure in translations, linguistic migrations, calque or loan-translation, when new words, yes, even “beta-fructofuranosidase”–-the enzyme bees use to convert nectar to honey—enrich tongues in sweet glossolalia. A public announcement was made by publisher Jeffrey Levine that Ardor would be the first of three titles that Tupelo Press was committed to printing. This created plenty of buzz in the poetry world, where such multi-book contracts are unheard of. Does this agreement provide comfort that you have a home for your future projects or anxiety that you must certainly write publishable books? Has this shaped or affected the way you consider or revise your current projects? This promise is a gift, the generous blessing of time. Like bread on the table, it is a “gift of protected liberty,” as Ann Lauterbach puts it. Since the collections were already finished at submission, it may seem there’s no more pounding coriander seed or manna flakes to make breakfast. However, a poet’s labor doesn’t end with book-making. New manna—provided for wanderers in the desert wilderness, as poets in American culture often live in forms of exile—still settles on the sand after the frost melts and awaits refining. I must gather it, write it down, otherwise it may vanish at day’s end. There is also the irresistible impulse to be daring, to be purer in voice and vision (“what it is” rather than “what is it?”), and to find what is rare. I’m grateful to do all of this. In other words, with the promise of three books, I am free to work on new projects or focus on other areas of writing life instead of sending, waiting, revising, and sending again. At the very least, this gift saves postage; in the long run, it yields peace of mind with a space for travel or reflection. For the past decade, I labored quietly in relative seclusion, staying out of sight except teaching students on a tiny campus with a serene chapel at its heart. Waking early in the morning, I’d sometimes walk around to see things—my attention is focused in the wee hours, although I prefer to write at night when attention dims to yield room for poetic accidents—to witness a hummingbird flick water onto its sleek green back in a granite fountain, to see magnolias hold out their immense ivory, and touch a bruised violet-skinned fig on the sidewalk. I still wake early and love my prayer walks; this aspect of my life hasn’t changed. I do hope to use this gift of time to travel more often to share poetry. I encourage those who want to write, who want to hear—to listen with utmost attention—the music of rare languages, to bear witness to survival in ragged crevices of existence. Concerned less with “what is it?” or whether the manna is viable, I receive this gift not as accident but as generous provision. "SMALL PRESS SPOTLIGHT: KAREN AN-HWEI LEE" was posted November 23, 2008. Previous entry: And Winner #8, the Last Winner Is….